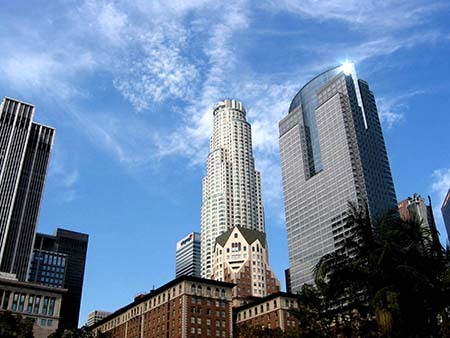 By the time I arrive in Downtown L.A, I’ve heard exceptionally alarming tales of Los Angeles’ central business district; how it attracts the unsavoury, how it isn’t safe and how there’s nothing of interest to see or do here – even the internet is firm in its disdain for Downtown. With these sinister images dancing mockingly in my head and cautionary words ringing in my ears, I arrive wondering if I should’ve retailored my itinerary to bypass this decayed, perilous jungle, and head straight to Santa Monica. But I’m the curious, rebellious sort, and I’m determined to discover the obscure beauty and vibrancy of Downtown L.A.
As it turns out, beauty in Downtown L.A is not as inconspicuous as I’ve been lead to believe. In fact, as I tip the cab driver and grasp my surroundings from the entrance of The Standard hotel, it’s the beautiful art deco like architecture of Los Angeles’ Central Library that grabs me. Inspired by Egyptian, Byzantine and Spanish design, the building boasts ornamental and symbolic compositions, including statues, sphinxes, snakes and mosaics. A colourful-mosaicked pyramid crowns the peak of the building, presenting a sunburst on each side and symbolizing the ‘Light of Learning’, stars a hand holding a torch at its pinnacle. 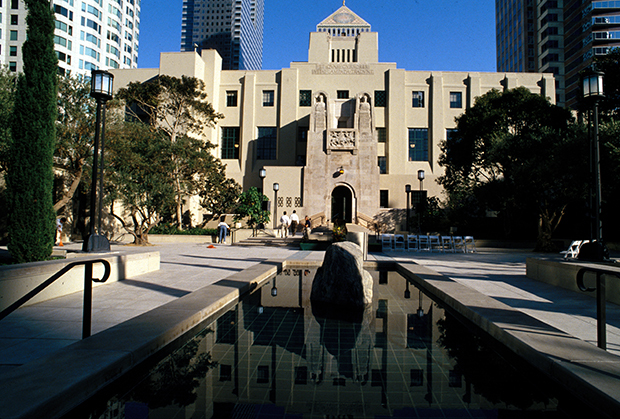 This is a library you’ll want to spend an entire morning or afternoon at; it’s a huge space and worth taking the time to explore, it has the third largest collection of books in the US and exhibits special items from Californian history in its very own gallery. Outside, the Maguire III Gardens with its pretty water features and Cyprus trees make for a pleasant scene for a picnic or photoshoot. A walk around the district uncovers more architectural gems. There’s the beaux arts style Millenium Biltmore Hotel, the magnificent Bradbury Building, the silenced theatres in the Broadway Historic Theatre District, the Japanese buildings (namely, the Nishi Hongwanji Buddhist Temple) in Little Tokyo, the Art Deco City Hall and the last great railway station to be built in America, Los Angeles’ Union Station. 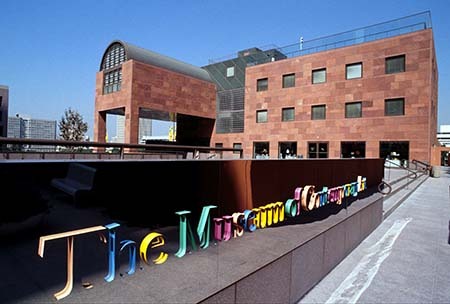 For a contemporary art and culture fix, Downtown hosts some wonderful museums and art galleries; the defining Museum of Contemporary Art, the stylish Hive Gallery & Studios and the thriving Los Angeles Centre for Digital Art are, but a few. After an aesthetically quenching morning, my friend and I seek out a coffee shop of London antipodean standards – nothing else will do. In a quiet street, on a doleful corner in Downtown L.A, sits Handsome Coffee Roasters and as we stumble in, in dire need of a caffeine fix, I drink in the fragrant aroma of perfectly roasted coffee beans. It smells like home. The interior is sparse in décor and furnishings, the rustic industrial scene of many a hipster coffee shop. I order a flat-white and the barista peers sardonically down at me “do you know what a flat-white is?” he asks, “it’ll come in this sized cup,” he asserts, picking up a small tea-cup. I’m tempted to reply with caustic sarcasm, but instead I smile and nod. My friend orders tea and the barista’s already sullen expression transforms into an incensed gaze. We are educated on how a real coffee shop only sells coffee. A peculiar statement about the store’s policy on sugar, soon follows this; coffee should not be drank with sugar, so sugar is banned at Handsome Coffee Roasters. This isn’t an issue for me, but my friend, who enjoys a spoon of sugar in her hot beverages, is not pleased about this pretentious attitude. Excellent however, is the coffee itself and later, balance is restored with friendly service and an excellent sushi lunch in Little Tokyo. Downtown is also home to L.A’s Fashion District, and if you’re a fashion lover, with an appreciation for new talent and innovative style, this is where you’ll want to shop, when in Los Angeles. The district boasts more than 1,000 stores, over 90 blocks – this is the place to shop the sample sales and grab bargain designer pieces. 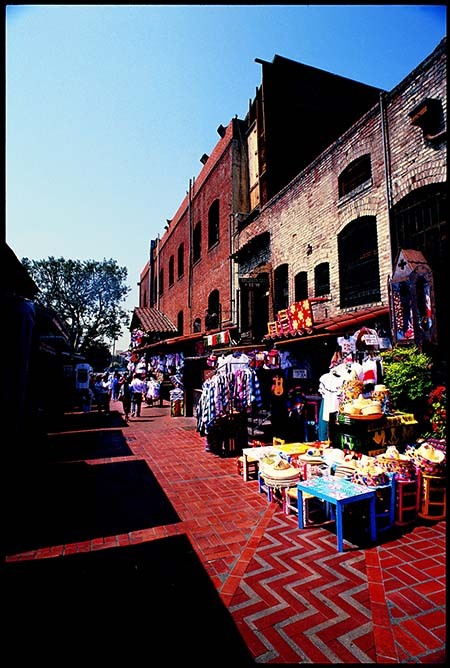 The milieu of the fashion district is also a testament to L.A’s diverse ethnic population and a refreshing sight after the ostentatious and immaculate exhibitions in Beverly Hills. It is true, Downtown, unlike L.A’s more popular neighbourhoods, isn’t the polished and glamorous area you might expect a major city’s downtown area to be; poverty and homelessness are acutely evident in parts, conveying a somewhat polarised neighbourhood. But regeneration of Downtown L.A is also tangible; once derelict buildings are being restored and divided into apartments and lofts for the influx of artists and designers to the area, the nightlife is celebrated by locals, tourists and celebrities alike and its fantastic restaurants are fast becoming some of the most enjoyed, in L.A.
One such eatery is the English inspired gastro-pub, The Parish. Located in Downtown’s vibrant fashion district, The Parish is housed in a 1930’s-esque building and brandishes the décor of the era, with dark wood floors and paneled walls, antique furniture, a beautiful tiled fireplace and Damask wallpaper displaying an antique map of Los Angeles – the expert presentation delivers the feeling of dining in a grand old ship. Angelenos tend to sup late, but even at 8pm, the restaurant is already thriving and I’m glad I’ve made a reservation. The long bar is the spirit of the restaurant; its bartenders expertly producing aptly named concoctions to eager diners – the menu currently serves Pimms Cup, King’s Landing and Cut & Paste, to name a few. Studying the dinner menu, I’m pleasantly surprised to see so many non-meat options – practicing a Halal diet, gastro-pub meals beyond glorified fish and chips and veggie burgers is a rarity, so I’m excited about eating here. The Parish’s offerings all sound wonderful. In the end, we order oysters, watercress salad, branzino (sea-bass), caramelised green beans and fried olives, served beautifully and all delicious, though it’s a challenge getting through the branzino without swallowing a bone. Dessert is a rich bread pudding – a little too sweet for my liking, but tasty nonetheless and typically English. Post dessert, I decide to brave the coffee menu and order a macchiato – I am thoroughly appeased; unlike the typical burnt, acidic concoction I’ve had in most L.A restaurants, The Parish do coffee properly (without the attitude of Handsome Coffee Roasters); my macchiato is smooth, strong, fragrant and distinctive. I only wish I had another day in Downtown, so I could visit The Parish for my morning caffeine fix and explore the area, further. Look beyond the often-disheveled façade of Downtown L.A and you’ll no doubt find hidden gems, a dynamic arts scene and a vibrant food and fashion culture.